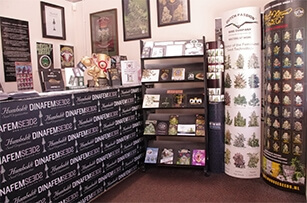 SeedMadness is the place to come for the freshest and finest cannabis seeds. With over 2500 strains from the world's top Cannabis Seed Banks and specialised premises open to the general public, you know you can trust SeedMadness for your weed seeds. We carry large stock of all of the most popular strains, including many Cannabis Cup winners and seeds from the best selling seed banks: Barney's Farm, Big Buddha, DNA Genetics, Dinafem, Green House Seed Co, Sensi Seeds, Serious Seeds & Sweet Seeds. We work hard to keep up to date in the world of cannabis seeds and will regularly include new cannabis seedbanks in our range of the best Seed banks worldwide. Our large collection of strains includes Autoflowering seeds, Feminised seeds and Regular seeds from some of the most renowned seed banks in the world. By shopping with SeedMadness you can be confident you will receive a knowledgeable, professional and experienced service. We guarantee our prices are low, which is why we have a Price Match Guarantee on every strain we stock. In addition, we offer FREE DELIVERY on all UK orders over £25.00 and FREE INTERNATIONAL DELIVERY on all orders over £250.00. The quality of our cannabis seeds are guaranteed, as we only buy the freshest seeds available and store them in a refrigerated room to ensure they remain at premium quality.